Pest control problems are the last thing that you want to deal with. It doesn’t matter what time of year it is, how serious the problem is, or what type of pest you have on your hands, the one thing that you want is to get rid of the pests as soon as possible. Here in Sacramento, there are so many different types of pests that you could find inside of your home. When you do, you want to have the best pest control company available helping you out. 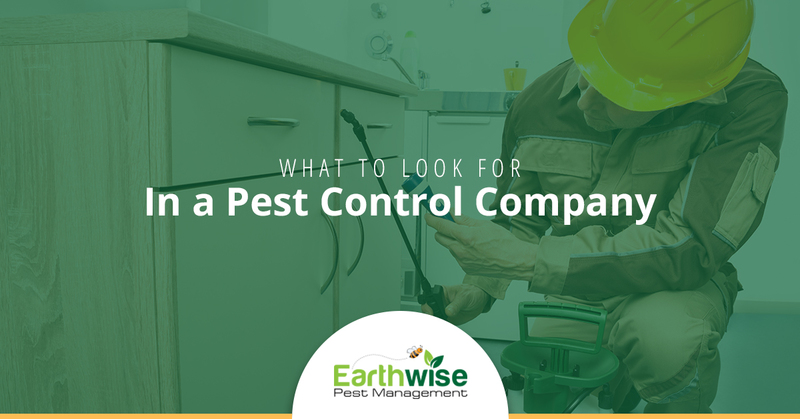 If you’re currently looking for a company to take care of your pest problems, it might be a little overwhelming to determine which pest control company is going to be the best fit for you. Keep reading to see what things you should be looking for before you commit to working with any pest control company. Experience is a major piece that you should consider when deciding who to work with, regardless of the industry. When it comes to pest control, the more experience that a company has, the better. When an individual spends years building a business, you can guarantee that they’re going to come across a wide range of scenarios. Not only will they work with different pests, but they’ll come across different situations. In doing so, they’ll be challenged to get creative with the removal of pests, making them even better pest control professionals. When it comes to getting pests removed from your home, you want to make sure that the individual that you choose to work with has experience with the pest that you’re struggling with and the tactics necessary to remove them. One of the best things about the internet today is that it offers the ability to get reviews for services and products before you choose to use them. Essentially, you’re able to get an idea of what you’re going to be getting before you ever actually use it! For most of us, this can be a saving grace that keeps us from working with individuals that make steep promises and fail to deliver. If there’s a company that you’re considering and they have incredible reviews, take them for what they’re worth to you! Spend some time reading them and seeing what everyone is saying about the service that they received and from there you can determine if this pest control company is going to be a good fit. Earthwise Pest Management takes pride in the reviews that we’ve received over the years. If you’re interested in seeing what our prior customers have said about us, click here. Having questions about the services that you’re going to receive and about the expectations that you should set for pest control company can leave you wary about moving forward. For that reason, we always suggest asking questions to the pest control company right off the bat. Whether you have questions about the way that they’ll be removing pests from your residence or commercial space, what the turn around time will be or anything of the sort, make sure to ask them immediately. Not only will asking these questions help you feel better about the service that you’re receiving, but they’ll provide you with some clarity on the concerns and questions that you have. The quality of service that you receive when working with a business is going to tell you a lot. When it comes to services like pest control, you don’t want to be working with a company that doesn’t get back to you immediately or provide you with straightforward answers to your questions. Rather, you should be working with a company that provides you with the best customer service available and lets you know that they’re going to take good care of you. Pest removal happens in a few different ways. This will differ from company to company and from pest to pest, either way, you should make sure to learn about the methods of removal that the company you’re considering is going to be using. Certain pest control companies could be utilizing methods that are high in chemicals and could pose a danger to your family. Aside from that, quick removal methods may not provide you with long-term results. Earthwise Pest Management offers Integrated Pest Management (IPM) removal services that not only keep your family safe throughout the entire removal process but also yields long-term results. By getting a better understanding of what the underlying root of the problem is, we can remove pests safely and take care of the factors that drew them there in the first place. Not every pest control company is going to offer this type of service, and for that reason, we suggest looking into what types of methods they’re going to make use of. After years of being a part of the pest control industry, our team decided that we wanted to provide something more. In creating Earthwise Pest Management we have been able to provide the high-quality service that we’ve always wanted to. From the solutions that we offer to the reviews that we’ve accumulated, there’s truly no better team for you to work with in the Sacramento area than Earthwise Pest Management. If you live in any of the following areas, contact us today to schedule your free consultation. If you’re ready to get started, contact us today to schedule your FREE consultation!